Our internet went down. We have Comcast wireless and our modem is over 4 years old, so we wonder if the modem is losing it sometimes. Also, from where the cable wire enters the house, there are several splitters, so that may be an issue too. What we did NOT count on was a lizard, a baby iguana, to be exact. It was 7:00PM, and I was ready to relax and spend some time on the internet. My sister called me and wanted me to view a web page she had made, but the internet was sooooooo slooooow, like the Slowskis times 10. I tried restarting my computer, since the first law of Technology Repair is restart. That didn't help; in fact, the modem "online" light just kept blinking and I could now get NO internet at all. I got to work. I put on my sandals and grabbed a flashlight and went outside to the back yard where the cable wire (we have Comcast) comes from the telephone pole to our house and then the splitter insanity begins. There is a splitter on the outside of the house. The wire goes into the back room, formerly the garage, and outside it splits off, and the new wire heads for the bedroom on the opposite end of the house. It travels up over the screened in porch and then travels along the underside of the roof to a hole in the wall and into my inner sanctum - the bedroom at the other end of the ersatz garage. I trundled outside to see if any branches from our many overgrown bushes were infringing upon the precious life-bringing internet wire, but I saw none on the old garage side. As I moved to the side where my bedroom/inner sanctum is, I shone the flashlight on the wire and......what is this?? 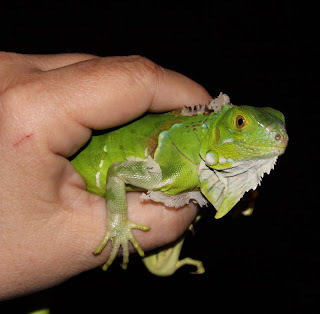 A baby iguana was draped and balanced on top of the wire, fast asleep, his exquisite greenness limp and his eyes closed (or what passes for eyelids on lizards were closed over his eyes). I saw this guy first on Saturday of this past weekend and tried to catch him then. I'm an animal and nature lover. I just wanted to hold him for a moment - to admire him up close, let my husband photograph him and then let him go. But on Saturday, he was too fast - and I could not catch him. However, at night, the power is on my side since lizards aren't great at night time sight. I touched this iggy's back claw and he didn't even wake up. I wondered if he was dead, but when I persevered in touching him, he opened his eyes and moved forward a bit, disoriented at what could be attacking him at night. I was able to reach up and grasp him about the midsection and - I had achieved my goal - I was holding the baby iggy. Here is one of the pictures my husband took. I was so proud of myself, went right onto the porch and called Hubby so he could rush to get the camera and photo my Iggy boy. Hubby had been messing with the internet wires trying to get something to work. Isn't he beautiful? He is shedding his old skin, which I tried to help him with, but when I discovered it didn't come off easily, I stopped, not wanting to hurt him. All in all - a total win win. I got to finally hold the baby iggy, the internet went back on due to nothing we can figure out - and here I am posting the entire adventure. Only if you count him living in my back yard. I can see him sleeping in the bush outside my window. I won't try to pick him up again - that was a one time thing.